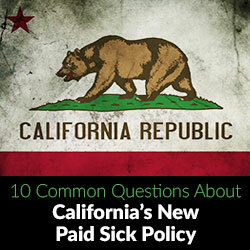 Now that California has a new paid sick day policy, businesses are asking, “How will affect my business?” This Q&A takes some of the top 10 common questions and breaks then down so you can better understand the new policy and make sure you are in compliance. 1. 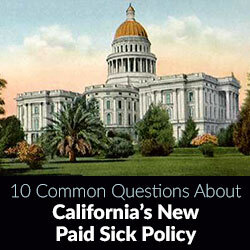 What is the New Paid Sick Policy in California? Recently, California passed the Healthy Workplace/Healthy Families Act of 2014, also known as AB 1522, which includes important measures on paid sick leave. As of July 1, 2015, anybody employed for more than 30 days (part-time or full-time) is entitled to sick leave. 2. Are Small Businesses Exempt? Unlike a lot of employment regulations, entrepreneurs, small businesses and giant corporations alike, are probably not exempt. In California, the exemptions for this policy are limited to in-home supportive service providers, specific airline employees and workers whose collective bargaining agreement provides them adequate sick pay. There are no exemptions available to small businesses, making California the first state to require practically all private sector employers to provide paid sick leave. 3. How Much Do Sick Days Carry Over From Year To Year? The employees don’t start back at zero on January 1. That would be a little unfair for the guy who gets a cold on January 3. After all, that is the middle of cold season, right? But how much do they carry over? You, as the employer have two options. You can set a policy where nobody can take more than three days or 24 hours of sick leave per year, and give them all of that leave at the beginning of the year. Or you can choose not to impose a particular cap, in that case, the max ends up being about twice that – 6 days or 48 hours. Either way, when an employee leaves, you don’t have to pay out the paid sick leave hours the way you would pay out vacation hours. 4. What If You Mess Up? Now for the teeth: of course you’re trying to take care of your people. But what happens if you make a mistake? 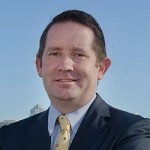 An employer who fails to give an employee their entitled sick leave, or threatens or commits any retaliatory action because of it, may be liable to damages of $250 to $4,000, in addition to reinstatement of the employee, back pay, withheld sick payment, and/or reimbursement of legal fees. So it pays to be careful. 5. How Much Notice Does A Sick Employee Have To Give? Employees must give “reasonable advance notice” in foreseeable cases and notice “as soon practicable” in those that are unforeseeable. The important bit here is that they have to tell you they’re going to be out. Failing to call, then showing up the next day and stammering weakly about having been sick – that’s not a sick day – that’s just plain ol’ blowing off work. 6. What’s The Smallest Sick Day? The amount of sick pay used is left to the discretion of the employee, though their employer can set up to a two-hour minimum. 7. Do Employees Have To Prove They’re Really Sick? Not really. While the legislation itself makes no reference to an employer’s right to verify illness, the Department of Industrial Relations’ “Facts and Resources” page on the law asserts an employee’s right to file a claim against any employers who “deny sick leave due to a failure to provide details.” This at least implies that demanding a doctor’s note for paid leave is grounds for legal action. Now, there’s nothing a doc can do about an allergy attack or a cold anyway. And requiring a doctors’ note just irritates doctors and clogs up waiting rooms for no real benefit. Perhaps best to look at it this way – we all trust our employees with much more important things than sick days. The law also provides some additional things you can’t do. We all remember that retail/restaurant job back when we were younger, where we had to get somebody to cover our shift if we needed to take off. But that’s not the rule with paid sick leave. The employer cannot require an employee requesting sick leave to find or even search for an employee to cover their shift. This creates a management problem – you need a backup plan for every shift. 9. How Do Other Businesses Make This Work? Of course, your business still has to make sure that shifts get covered, classes get taught, customers get served and phones get answered. How to do that if people can call in sick with very little notice? We asked some of The Moore Firm’s clients how they cope with the practicalities of getting shifts filled, and found some common themes. 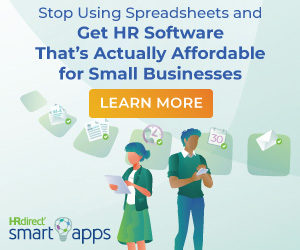 The businesses had a backup roster – they knew when some of their “off” employees would be available as backups, and have a ready list of one or two backups for each shift. They have found that the backup employees were happy to fill in shifts when something came up. They also asked their employees to request a sick day by telephone, instead of texting or emailing. They found that this simple change cut down on sick days taken. Overall, in the months since the Paid Sick Days statute went into effect, our clients have reported that there has been no noticeable increase in the number of sick days taken by their staffs. Although there’s a lot to keep track of in the statute, it looks like the change has, in practice, been manageable. How Can PTO Fix Everything? Before we close, we should note that there is one very simple alternative way around all of this – the Paid Time Off policy. A Paid Time Off policy lumps sick days and vacation all into one pile. A PTO policy that doesn’t differentiate between sick, vacation and personal days carries several benefits, as it doesn’t encourage employees to use every saved sick day (or lie when they need a day off), is much simpler and more flexible to administer, and can boost morale by providing a stress-free option for employees to take time off as they feel necessary. If a PTO policy satisfies the accrual, carry over, use, and minimum hour requirements of the new law, then the employer needn’t offer separate paid sick leave. With these potential benefits, a reasonable PTO policy may be the best option available for many employers, both to avoid penalties tied into the new law and to create a generally healthy work environment. There are a few other technical nuances to complying with the law – giving notice of your Sick Day policy upon hire, tracking accrued sick days with pay reports. But the intent here is to provide a basic overview. If you have questions about any aspect of the law, or other compliance or regulatory issues your business faces, call us at The Moore Firm. We are here to Solve Business Problems. once solved, the problem stays solved.